Knowledge is situated, and so are learning processes. 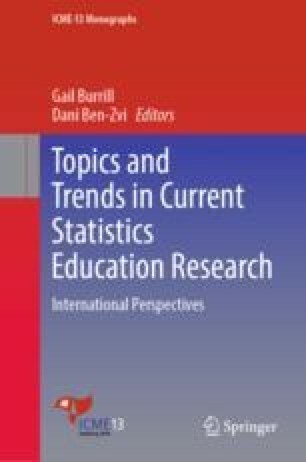 Although contextual knowledge has always played an important role in statistics education research, there exists a need for a theoretical framework for describing students’ development of statistical concepts. A conceptualization of measure is introduced that links concept development to the development of measures, which consists of the three mathematizing activities of structuring phenomena, formalizing communication, and creating evidence. In a qualitative study in the framework of topic-specific design research, learners’ development of measures is reconstructed on a micro level. The analysis reveals impact of the context of a teaching-learning arrangement for students’ situated concept development. Stroeve, J. & Shuman, C. (2004). Historical Arctic and Antarctic surface observational data, version 1. Retrieved from http://nsidc.org/data/nsidc-0190.